Coming up the slopes of Mt. Taylor in NM was the first snow I hit on the CDT. I’d been hiking with a pair from England; we briefly considered getting an early start before an overnight storm brought rain to our camp, but a fresh dusting above the treeline. If we hadn’t been able to see the snow up there when it was still many miles ahead you would’ve hardly expected as much snow coming up from the hot desert and El Malpais of the past section. The San Juans were like a fully self contained winter that we just wandered thru betwen mid May and early June; save for the warm air temperatures. I had plenty of days where Snuffles and I seldom stepped off the snow, and barring the wind we probably would’ve wanted to wear shorts most of the way too. 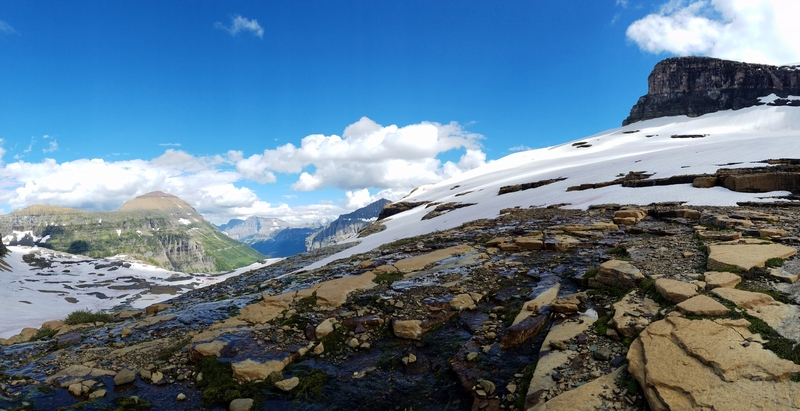 A view from Boulder pass, last year when I was still heading West I was maybe a little early for this route thru Glacier National Park, and there were a few more steepish snow traverses than I would’ve wanted. I’m excited to get back there in a few weeks. It was hot then, and its hot now, but I wonder how much snow will be left on the trail. I only recently broke my streak again, this time thru ID was the first state since ND without any snow. Finished the CDT and closed the Great Western Loop yesterday! I'm pretty tired of walkin for now. Think I'm gonna try to find a boat and float around for a little while. A short way into the Bob Marshall Wilderness, the fires couldn't keep us out entirely. Up this valley the smoke wasn't even bad. Devastation on our way to Gunsight Pass.